The limitations of conventional electricity production have become quite visible by now. Not only it has been miserably unsuccessful in supplying the overall electricity requirements of our cities, it has also been leaving a negative impact on the environment. Therefore, something else is needed to mitigate these issues. And Solar Energy has the potential to become that something else. It’s cleaner, more reliable, and it can provide the requirements of every home and office. No surprise why government is betting big on it. In a series of efforts to make solar panels mainstream government has now launched an online portal solarrooftop.gov.in from where people can apply online to get a panel installed on their roofs. This step will make the process of adopting solar energy more easier than it is. Before the launching of this portal application process required people to download the form, fill it and submit it personally. As you can expect, that tedious process failed to gain momentum. So now Ministry of New and Renewable Energy (MNRE) has come out with this portal that’ll allow online submission of applications. Indians tend to be price conscious. I know you’d like to have an idea about the price of your solar panel installation before applying for it, so I’d like to tell you something: The pricing varies depending on your requirements. Moreover, it also varies depending on the type of panels that you want to install. Access the Solar Rooftop Calculator and click on your state in the map. The price depends on average solar irradiance, which is nothing but a function of distance of your state from Sun and Solar Cycle. It directly affects how much power a 1kW Solar Panel generates every day. 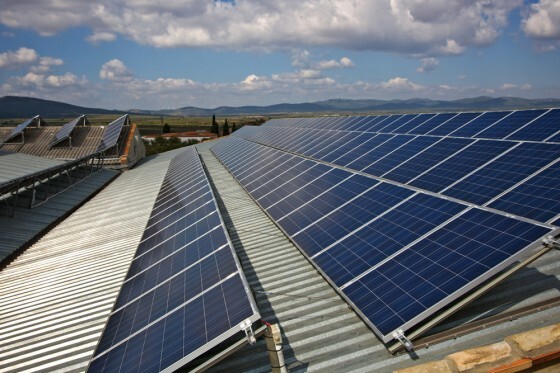 In areas of more solar irradiance panels generate more electricity so people living there can install less capacity, while in areas of less irradiance panels generate less electricity so residents must install slightly more capacity to achieve similar energy generation.The more capacity you install, the more its cost will be. That’s why installation costs vary from state to state. On next page you’ll be shown various options where you can submit your requirements. The page provides 3 options in its first section and you can calculate your costs by choosing any or all of them. First two options allow you to calculate your costs either on the basis of your rooftop area or the capacity that you want to install. The third option will allow you to define your budget and will show you how much capacity can be installed within that budget. Based on the information you provide the tool will show you estimated cost of your installation. How to Apply Solar Rooftop Panels ? Visit this webpage to access Solar Rooftop Installation Interest Form. On the first page you’ll be shown two options: Private Sector and Government Sector. You need to choose the relevant category to which you belong. Unless you’re applying on behalf of a government organization you belong to Private Sector, so you need to select that option. You need to select Government Sector only if you’re applying on behalf of a government organization. Depending on the option that you chose in Step 2 you’ll be shown your Interest Form. You’ll have to submit the required information by using that form to tell government about your interest in installing a Solar Rooftop Panel. Once you submit the form, the team responsible for installation of solar panels in your area will contact you. You’ll have to discuss the time of installation with them and other related information. Once everything is finalized, the engineers will visit your site (home/office) on your desired time and the installation will be done. This is installed solar power capacity of top 6 states. The total capacity installed in India is more than 7.5 kW as of May 2016. And government has a plan of expanding on this picture by investing more than $100 billion over a course of next 6 years. When that happens, more than 100 GW solar power capacity will be installed in India. So you should get on-board as soon as possible. Solar is the future, and it’s not too distant now. Central government has turned its attention towards generation and distribution of electricity through renewable power sources. The Ministry of New & Renewable Energy or MNRE has decided that farmers, who are using solar powered irrigational pumps, will receive a subsidy up to 30%. This benefit will be offered to those agricultural workers who apply under the Off-grid and Decentralized Solar PV Applications Programme. Reports suggest that the authority has distributed as many as 1.85 lakh such pumps till date. This central government department is also offering necessary encouragement to continue research for development of power generation from safe and clean or renewable sources. Apart from solar power, research and development is on to harness more out of biogas and wind power. Sir,I wish to join you r scheme of solar rooftop paannelsto be installed at my residence in Ratnaggiri.